The stores have been playing Christmas music for weeks, but for me, nothing signals the start of the season like seeing all those bright-red Poinsettias. The botanical name given to Poinsetias, Euphorbia pulcherrima, literally means “very great” or “very beautiful”; and if you’re like me, you’ve probably already grabbed a few of these beauties to give or keep for yourself. Whether you plan to enjoy these plants for the season or attempt to save them for next year, I’ll share some facts and growing tips that should grab the attention of either group. While in the U.S. most Poinsettias are sold during the six weeks before Christmas, up to 70 million annually, they actually prefer a moderate climate with temperatures in the range of 60 to 70 degrees Fahrenheit. They are native to the deciduous tropical forests of Mexico and grow into large shrubs reaching 10- to 15-feet tall. Poinsettias are photoperiodic plants, meaning that they set buds and produce flowers as the nights get longer; naturally they begin blooming in November or December. The attractive, colorful part of the Poinsettia that we consider the bloom is actually a modified leaf known as a bract. Coordinating the bloom time with the holiday season can be challenging as they must receive 14 continuous hours of complete darkness each night to attain their gorgeous colors. Ironically, once they complete this process, they require abundant light to retain the brightest colors. 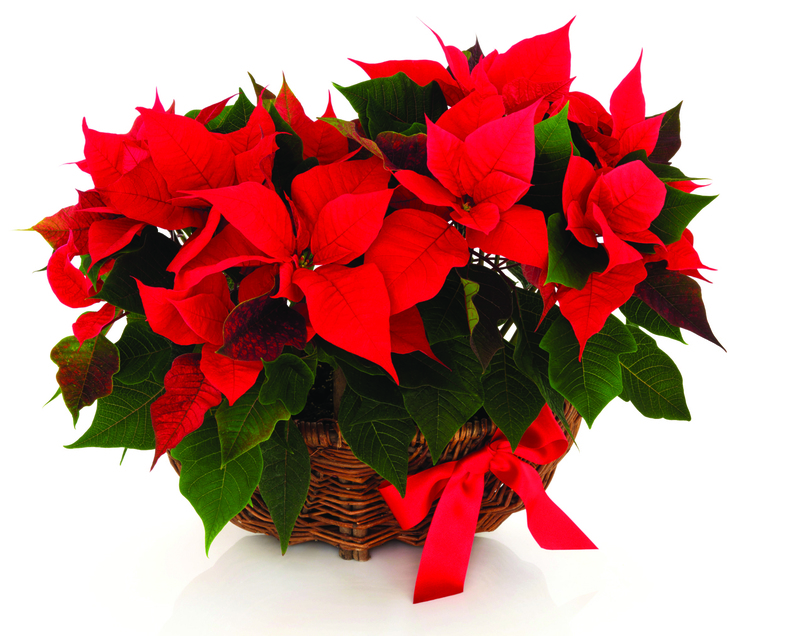 One of the most common myths about Poinsettias is that they are poisonous. As a member of the Euphorbiaceae family, they do produce a milky sap that can cause irritations to those with latex allergies. However, the plant is not poisonous and a person would have to consume more than 500 leaves to result in a harmful effect. If you’ve yet to purchase your Poinsettias, here are some pointers for picking a plant that will last all season. The colorful bracts will drop once the pollen sheds, so look for plants with little or no yellow pollen on the flowers. The plant should have dark green, dense foliage all the way down the stem. Avoid any plants with waterlogged soil, especially if they look wilted. For aesthetics, the plant should be about 2 1/2 times taller than the diameter of the container. Poinsettias need at least six hours of indirect, natural daylight. The bracts are delicate and should be protected from wind and cold rain. Avoid placing them near drafts, excess heat, ventilating ducts or dry air from appliances. Daytime temperatures should not exceed 70 degrees Fahrenheit and night temperatures should not drop below 55 degrees Fahrenheit. They like moderately moist soil so water when the soil surface feels dry to the touch, but don’t allow them to sit in standing water. If you’d like to keep your plant after the holidays make sure to keep it protected until night time temperatures are consistently above 55 degree. Once the bracts all drop, prune back to about 8 inches in height. Provide regular water and fertilize every three weeks into the fall months. You may need to prune during this time to keep the plant compact and full, but do not prune after Sept. 1. Our mild climate will allow this plant to be part of the landscape, but if you are hoping to achieve those vibrant colors again you may be better off keeping it in a pot. Beginning Oct. 1 the plants need 14 hours of continuous darkness each night to re-flower. Even the dim glow of a street light can interrupt the photoperiodic process and delay or completely stop re-flowering. Covering them with a large box or moving them into a closet at night may be necessary.